Getting Serious: An End to the Russia-Japan Dispute? It’s not the first time a resolution to the disputed islands has been touted, but conditions now may encourage compromise. As Japan remains mired in seemingly intractable territorial rows with China and South Korea, there seems to be a window of opportunity on its dispute with Russia over the Northern territories (referred to as the Southern Kurile Islands in Russia). On August 19, Japan and Russia will formally commence high-level negotiations on resolving the dispute, which has thus far precluded both sides from formally signing a peace treaty to end hostilities from World War II. This follows up on a pledge by Japanese Prime Minister Shinzo Abe, during his historic state visit to Russia this past February, that he is committed to working with Russian President Vladimir Putin to finally reach a mutually acceptable conclusion to the issue. The meeting later this month in Moscow will bring together Japan’s Vice Minister for Foreign Affairs, Shinsuke Sugiyama and his Russian counterpart Igor Morgulov. While the agenda will also focus on positive engagement, such as bolstering energy ties. Yoshihide Suga, Japan’s Chief Cabinet Secretary, hinted earlier this month that early discussions on a peace treaty were “possible.” While the language is non-committal, the policy tilt from Tokyo over the past six months has been significant. For the past decade, Japan-Russia relations withered as politicians in both countries tried to assuage nationalist sentiment and engage in politicking. Indeed, it was less than three years ago that former President Dmitri Medvedev became the first leader of Russia or the former Soviet Union to step foot on the disputed isles, prompting then-Japanese Prime Minister Naoto Kan to call the actions an “unforgiveable outrage.” And a Russia-Japan détente has not been made easier by Moscow’s recent embrace of Beijing – even though the nature of such engagement is opaque and likely benign in the short term. In fact, Abe’s drive for a compromise with Putin was initiated from the first days after his election last year and was actualized with his dispatch of special envoy and former Prime Minister Yoshiro Mori to Moscow this past February. 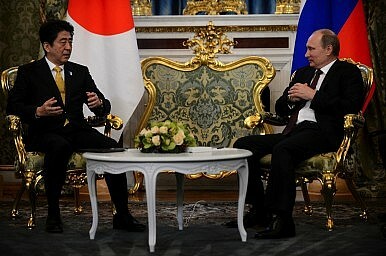 Mori, who maintains a close personal relationship with Putin, made waves in Japan by going on national television before his visit and floating the necessity for a compromise on the territorial dispute, stressing that this was the only “realistic approach” to resolving the spat.